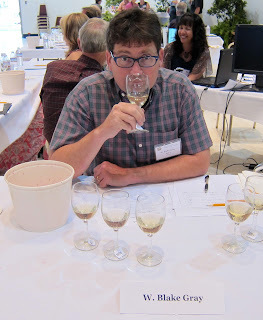 My column for Palate Press this month is about my misadventures judging at the California State Fair wine competition, where it will surprise my blog readers to learn I was miserly and stubborn. Remember when California Chardonnay meant oaky, buttery wines that tasted of tropical fruit? There has been a backlash against that style for a few years, but it seemed like a stream of artisanal wines against a tidal wave of highly rated goo. Well, the tide has turned. Mainstream California Chardonnay now is lean, with citrus fruit flavors, not butter and toast. I know this because I tasted dozens of California Chardonnays, many of them submitted by California's largest wine companies: Constellation, Gallo, The Wine Group. These companies are not trying to change minds -- they're trying to move cases. They're making Chardonnay in the way they expect it to sell. In 2007, when Charles Shaw embarrassed the competition by taking best of class Chardonnay, judge Michael Williams told ABC News: "The characteristics that we look for in our gold medal winner … a nice creamy butter, fruity." In 2013, "nice creamy butter" was out, and not only with judges. This year's Chardonnays were lean. Light. Citrusy. And not just those companies' wines: almost every Chardonnay we tasted fit this new profile. Overt oak flavors were rare; butter even rarer. Now, I'm not saying these Chardonnays were great. Read the Palate Press piece: I was not generous to them, though they were significantly better than our 31 Zinfandels. Whereas five years ago a group of Chardonnays at this competition might have been overbearing, this month they were mostly inoffensive. This doesn't mean the "cougar juice" style, heavy on the butter, vanilla and pineapple, is going away. Nor does it mean that Wine Spectator and the Wine Advocate won't continue to give that style the highest ratings. There's so much California Chardonnay sold -- 20% of all wines in the state -- that more than one style can be successful. I'm also not saying this is the end of evolution, or that this is the way Chardonnay should be. I'm not editorializing today about this development in California Chardonnay: I'm merely documenting it. Cheaper to make chardonnay this way too. With grape prices unsustainably high it makes sense to make wine in a tank with some well-deployed oak adjuncts. Cut out the barrel ferments or ageing and you cut off $10 a case which is $2-$3/bottle on the shelf. Thanks Cameron, that's a fact worth knowing. I wonder how much of this change in Chardonnay is due to public demand, and how much to producer economics? I wouldn't lump all California Chardonnay together--the differences between Chardonnay from Napa, versus Carneros, Russian River and Central Coast can be significant. Blake - hard to say...the somm crowd has been pushing for this and a few producers are finding success with it so there is definitely demand for less wood/malo chardy. That said, our highest velocity chardonnay's are all classic 90's buttery, oaky style whether its from Napa or Monterey county. We make leaner styled wines off of Atlas Peak that are far less commercially successful but they are beautiful wines just have a smaller audience. Amy - I don't think Blake is lumping all chards together, just discussing a style trend. That said, even within those appellations there is tremendous variation based on soils, fermentation temps, cooperage, malo/no malo, etc. Leaner and meaner (bcuz oak is too expensive) should be their slogan. "Cougar juice?" What are you referring to? "Cougar juice" is what some winemakers in northern California call buttery, sweet Chardonnays. It refers to the group of consumers who like these wines. I first heard the term about two years ago and now I hear it all the time, but it's probably still pretty insidery as nobody wants to say that in front of the, er, cougars. What vintage were you tasting (primarily)? If it were 2011 then there was little choice as to what style you made. Nature made many decisions for you that vintage. Adam: That's a good question. We had about 2/3 from 2011. I see your point, but propose that 5 years ago, vintage be damned, there would have been butter and toast. That's what oak chips and induced malo are for. Thanks for validating what I have been experiencing. I usually ask for an oaky Chardonnay in restaurants and last weekend I was told they were now out of style and that they didn't have one. I guess I am the last to know.I live in Mill Valley,CA. We made a Russian River Valley Chardonnay from 2011....waited until mid/late October to pick it. Barrel fermented it, put it through 100% ml (induced it). The wine ended up being 13.4% alcohol and still just 3.4pH and a TA of over 8. Not really certain you can diminish how different the 2011 vintage was and how, no matter the winemaking involved, it effects the wines. If anything, this might be the perfect vintage to go with 100%ml and oak fermentation in that it still didn't detract from the character of the fruit. Our 2011 BFC was harvested on November 7 at 20.6 Brix, 3.08 pH and is Dijon Clone 76 & 95. After whole cluster pressing to preserve acidity, we filled a new Puncheon and let the games begin. Malo-lactic was completed and we aged on the lees for 16 months. This wine is sublime and tenacious. It will arguably outlive (or maybe oust) your fillings Blake. I for one applaud the shift away from the crème brulee tasting Chardonnays of several years ago. The trend was taken too far. But I fear the reaction may take the counter-trend too far the other way. Labels trumpeting "naked" "unoaked" "natural" etc are becoming a little too common among the lower end. I don't think that style works either. The early 2000s produced some wonderful New World Chardonnays, that underwent malo and had judicious use of oak. To me they spoke of the varietal, not of wine-making. I hope that not everyone adopts leanness to excess. I want my Chardonnay to taste like Chardonnay, not Sauvignon and not Crème Brulee. Pardon my soap box but California Chardonnay is having a serious (and IMHO, disastrous) identity crisis! Steel vs Oak; Malo vs Non; Lees or not? As a result, there's few that turn out right and the varietal as a whole, is losing its intrigue. (I'd much rather have a Daou Grenache Blanc, a Breggo Pinot Gris or even a Kung Fu Girl Riesling.) Don't get me wrong, I'm all for a diversity in styles but pick one and go with it - full force and whole-heartedly. If I want crisp fruit bolstered by nice acidity, I'll reach for a Puligny-Montrachet, not a fence-riding Cali imposter. Conversely, when I choose a Cali Chard, I want texture, richness...OK, if I must admit, an oaky butterball.